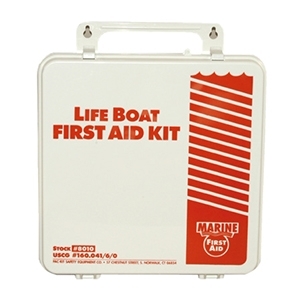 PAC-KIT USCG APPROVED LIFE BOAT FIRST AID KIT Coast Guard approved (approval #160.041/6/0). High impact waterproof polystyrene case measures 9-1/2" x 9-1/2" x 2-3/4". Contents include: 1 unit #1-002 adhesive strips; 3 units #2-004 4" bandage compresses; 3 units #2-006 2" bandage compresses; 2 units #3-005 gauze compresses; 2 units #4-006 triangular bandages; 2 units #7-009 eye flush, pads and strips; 1 unit #9-001 ammonia inhalants; 1 unit #12-018 antiseptic towelettes; 2 units #13-010 burn gel; 1 #17-011 tourniquet; 1 unit #20-001 aspirin; 1 unit #21-003 wire splint.